in Computer-guided Implantology to improve their skills and confidence. and discover all tools ​that they can include in an everyday practice. what kind of tools should be the best to integrate. ​Most of the systems are closed and protected by strong monopoles. Dentists are perplexed about the use of these tools. ​​Each participant is invited to bring his own lap top and computer mouse to be able to take profit of the workshop. Free demo program and cases will be provided for each participant. 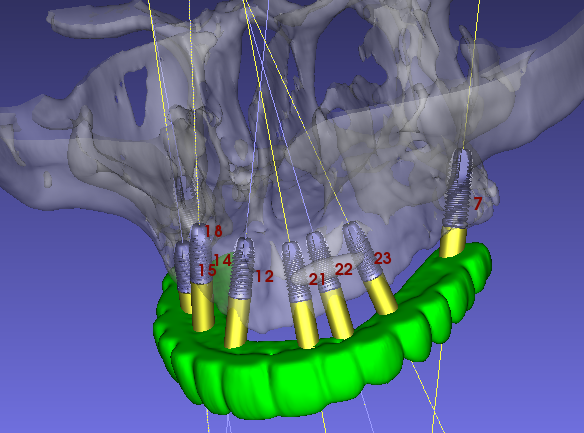 Introduce participants to Computer-guided Implantology. plan one implant and understand how to order and use a surgical guide. * Importance of Accuracy in Implantology. * Computer-guided Implantology illustrated with clinical cases. * Integration of Computer-guided Implantology in the office: how to establish costs, make an adapted case presentation, establish fees, which communication tools to use with the implant team. * How to get benefit using our computer? 1. How to set up our computer to organize files? 2. How to get help from the Internet? 3. How to transfer big files such as CT scan data? 4. How to get information and support using E-mail? * What kind of letters to use with patients, radiologist? * AxisGuide® Workshop on demo cases. Importance of Accuracy in implantology. Treatment plan in five steps. o How to go from 2D to 3D? o How to plan implants? ​which communication tools to use with the implant team. limited to implantology and aesthetic reconstructions. of a fundamental book: "The Art of Computer-guided Impantology". Since 1993, he is involved in Computer-guided Implantology techniques. Dr. Philippe Tardieu has been the one to set up the specifications of the AxisGuide®. This program is an open program, it is a new and innovative suite of modules in the field of Computer- guided Implantology and Diagnosis (impacted teeth, tumors, nerve path…). It brings a very sophisticated technology at the fingertips of dentists. To σεμινάριο θα πραγματοποιηθεί στην αγγλική γλώσσα. είναι προγραμματισμένo για περιορισμένο αριθμό συμμετεχόντων. Με την επιβεβαίωση και αποστολή της εγγραφής, συμφωνείτε με τους όρους κράτησης της θέσης. Η εκδήλωση μπορεί να βιντεοσκοπηθεί από τους οργανωτές και κατά τη διάρκειά της να ληφθούν φωτογραφίες για το αρχείο και για την προβολή της εκδήλωσης σε μέσα μαζικής ενημέρωσης/επικοινωνίας.